Teela Cunningham has taught over 8,000 students since teaching her first class on Skillshare 9 months ago. Since then, the supplemental income from her Skillshare classes gave Teela the confidence and support she needed to quit her job and pursue her entrepreneurial dream. When Teela Cunningham was a graphic design student at SCAD, her teachers told her she had a knack for explaining her design process to other students. Little did she imagine that a few years later she’d be doing it with thousands of students as a full-time job. After graduating, Teela had practically every other job imaginable - from working at a startup to a boutique home furnishings business to freelancing on the side. As she was challenged to keep up learning new skills for new jobs out of school, she started posting these learnings each week, and her blog, every-tuesday.com was born. With the tagline, “They don’t teach you this in art school,” every-tuesday.com started to grow a following of beginner and advanced designers looking for new tips and tricks. Running her self-described “one-lady show”, Teela started to dream about how she could spend more time on her business. “I always have had an entrepreneurial side to me -- that first job at a startup of seeing people create their dream, I felt like I could do that someday. I wasn’t totally sure how that was going to happen -- then I started doing classes on Skillshare. 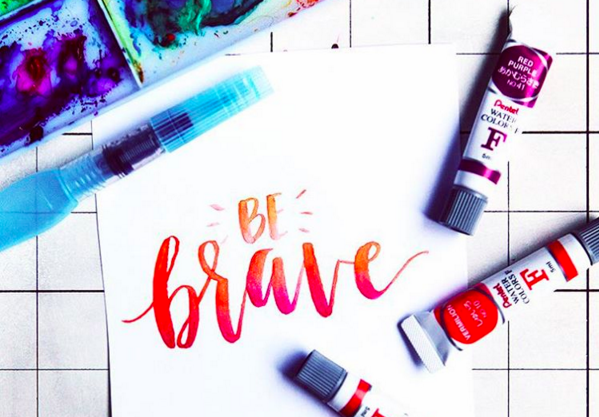 While Teela’s most recent class, Waterbrush Lettering Essentials continues to enroll over 3000 students, Teela stays busy creating new classes, selling design kits and advertising her blog. I want to continue with Skillshare because teaching is such a huge part of who I am now. It’s life-changing. It has changed my entire life literally - being able to leave my job and find more confidence.